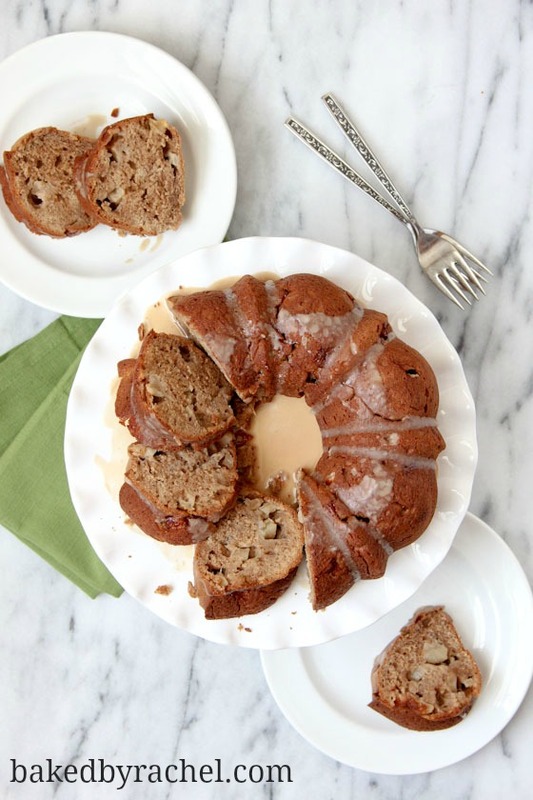 Moist homemade apple cinnamon bundt cake, perfect for breakfast, snack or dessert. I started 30 Day Shred again. Yes, again. This is my second or maybe third time. I can’t really remember but at least second. Last time I started it, had ER visit (months and months ago… this was the ‘child sliced her finger while not waiting for help’ incident), got sick… likely from the ER because we all know how clean hospitals are and just totally lost momentum. Plus when I get a cold it seems to last forever. And by forever I mean easily 3+ weeks. You have the coughs and the sniffles then the omg I can’t even breath right. So yeah… I started it up again. Finally. I hate the jumping jacks the most. It’s always been my most hated part about the first phase. I can’t explain it. They’re simple but I hate them. At least I know what’s coming though. I know what to expect. But here’s the thing. I’ve never made it beyond the first part. It’s not a quitter thing really, maybe slightly. But the unknown kind of scares me but hopefully when I make it through level one I’ll be ready to tackle level two. Someone give me hope and tell me it’s just different exercises and not necessarily harder. Believe me, I know I’m lying to myself when I think like that but a pat on the back would be nice. I think my shoulders are going to fall off right now. So instead of sharing a super delicious savory dish. I sat staring at these photos. Memories coming back to me of how insanely delicious this bundt cake was. I desperately want a giant slice of this right now. If only I had magical abilities or even Jeannie abilities. You know… Jeannie the genie. Yes, I watched that as a kid and kind of miss it. But anyway. I want to put my hands together and blink a slice before me. Or maybe twitch my nose only I could never make that happen. Could you? I’ll stick with Jeannie over Bewitched. Definitely easier. 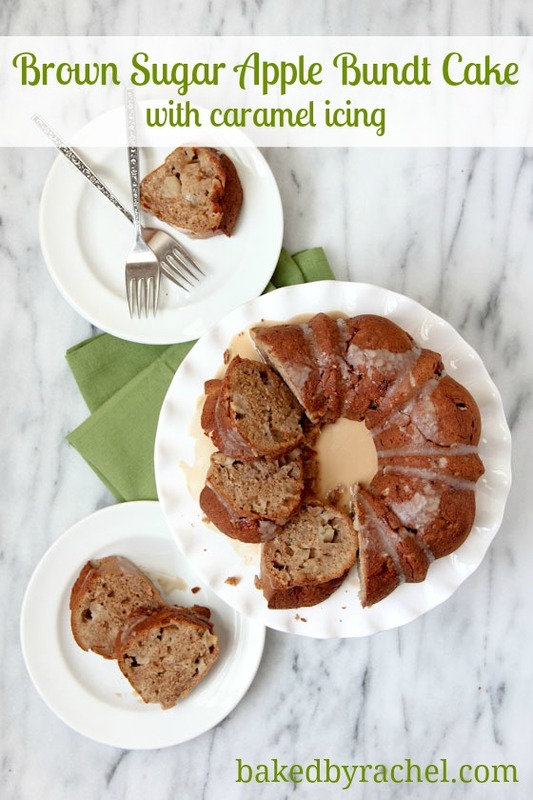 This bundt cake… it’s amazing. Practically other worldly. It’s moist and incredibly flavorful. I highly recommend, no… I insist that you do not leave off the icing. You must make it. It adds that extra something special to an already perfect cake. 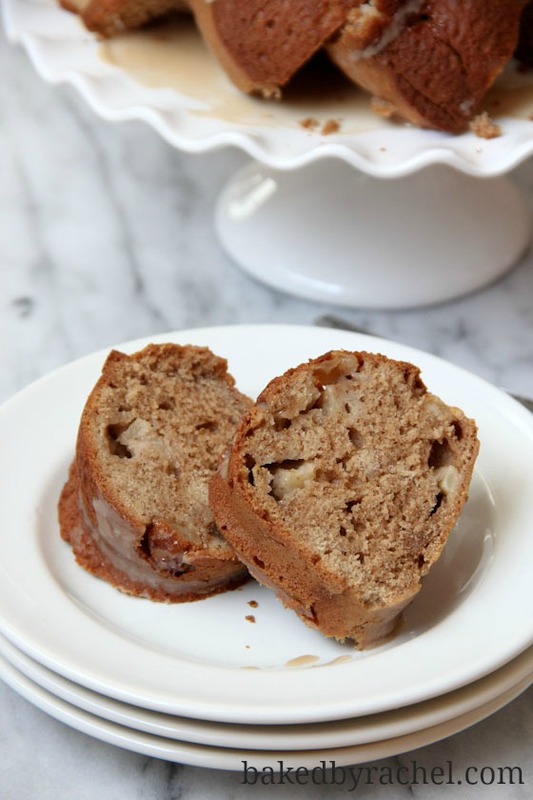 You know what the best part about this cake is, besides the apples of course? You can eat this for breakfast, snack or dessert. Or in my world… lunch or dinner, because let’s be real. Be sure to put this on your Mother’s Day menu, that special mom (mom, wife, gramma, neighbor, sister, daughter) in your life will love you for it. Preheat oven to 350 degrees. Lightly grease an 8-inch bundt pan. In a large bowl or stand mixer, cream together sugar, butter and yogurt until smooth. Add eggs and vanilla, mixing until just dispersed. Add in remaining dry ingredients, minus apples. Mixing until creamy. Finally mix in chopped apples. Spread batter evenly in prepared bundt pan. Bake for 40-50 minutes or until golden brown and a cake tester inserted comes out clean. Rest cake in pan for 2 minutes prior to inverting onto a parchment lined cooling rack or cake stand. Cool completely prior to slicing. Store in an airtight container. Prepare the icing by mixing together powdered sugar, water and caramel extract until smooth and a thin consistency. Drizzle over cake prior to serving.